Grease the bottom and sides of an 11x7 inch baking dish or 10 inch quiche dish. Heat butter in a small nonstick skillet and saute until tender. 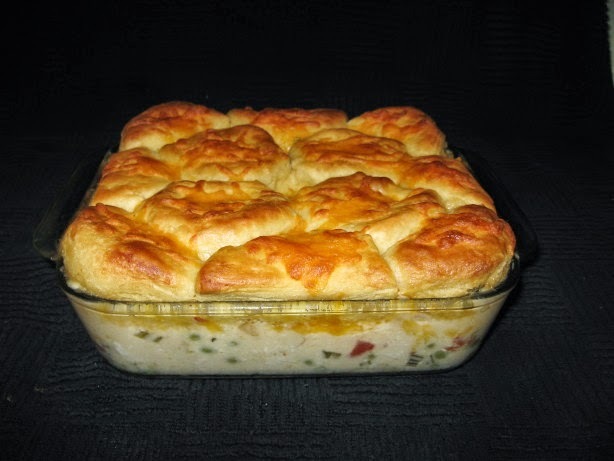 Combine cooked onion, soup, chicken, milk, pimiento, and mayo in a bowl and then turn into the prepared baking dish. Sprinkle 1 cup of the cheese over the baked mixture. Arrange biscuits decoratively in a single layer and sprinkle remaining 1/2 cup cheese over them. Return casserole to oven and bake until biscuits are golden brown and sauce is bubbly, usually about 20 minutes longer. NOTE: 02/16/09: This is RICH! You may sub sour cream for all or part of the mayo if you wish to cut back on the heaviness. The last time I made this I used a 1/4 cup of fat free mayo and 1/4 cup of sour cream. I think it was delicious! Also -- I took the suggestion of adding a cup of cooked green peas. What a terrific idea! I LOVED it! I think I might add two cups next time. Thanks to you all for making my humble recipe and leaving your suggestions. You GREATLY improved a recipe I was already proud of. Thanks so much.